Ladies and Gentlemen, we have moved beyond the realm of standard cupcakes and moved into fancy cupcakes. A friend and I finally got together for our cupcake baking adventure. She has a great cookbook: Cupcakes by Elinor Klivans, and had earmarked the Chocolate Covered Hi-Hats as our culinary adventure. Looking at the picture in the book, I didn't know if our finished product would measure up. But it did. 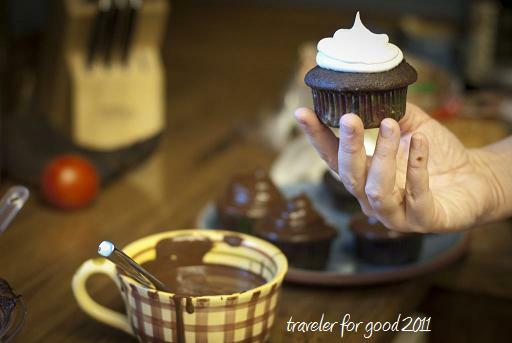 All the pictures in this post were taken by my friend Angela....cooking with friends is much more entertaining and in the case of these cupcakes, four hands were better than two. This recipe is all about the frosting and the dipping. We opted to use cake mix to make the chocolate cupcake base. We had two kinds, the Sprinkles brand from William Sonoma (apparently the only thing you can buy in the store with a $10 gift card) and a triple chocolate mix from Duncan Hines. The key thing about baking these cupcakes is not to overfill. You do not want a muffin top when you start dipping a top heavy cupcake into chocolate. 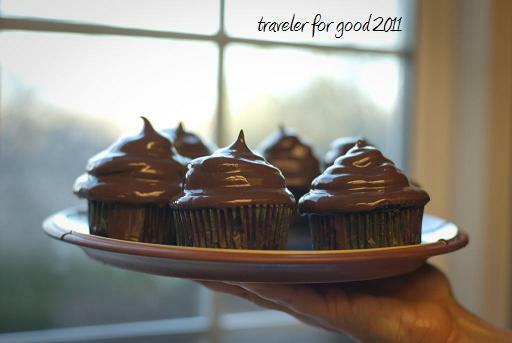 Once you have baked and cooled your cupcakes, you are ready for the next step. This was my first time cooking a frosting. The white frosting has almost a marshmallow-like consistency. It holds up amazingly well for the dipping stage. Put sugar, water, egg whites and cream of tartar into a heatproof container. Beat with hand mixer 1 minute until foamy. Put heatproof bowl over a saucepan of simmering water. Beat on high for 12 minutes (until the frosting reaches 160 degrees) and forms stiff peaks. Remove bowl of frosting from heat, adding vanilla and almond extracts, beating 2 more minutes. 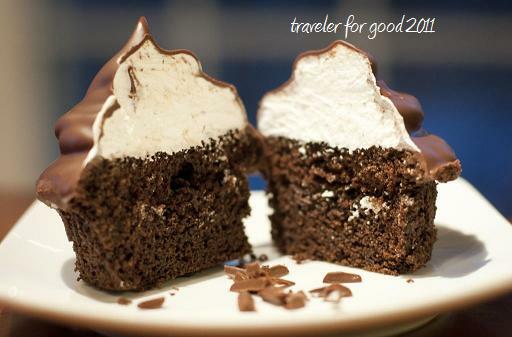 Fill a pastry bag full of the icing and put a big swirl on the center of the cupcake (up to 2 inches). Put iced cupcakes in the fridge to chill. The picture in the book reminded me of a dipped ice cream cone at Dairy Queen. I still love a good cherry dipped cone if I can find one. The same scientific principle that stops your ice cream from falling in the vat of cherry coating must be what works in these cupcakes. The frosting "adheres" well to the cupcake and once chilled it can stand up to the quick dip. 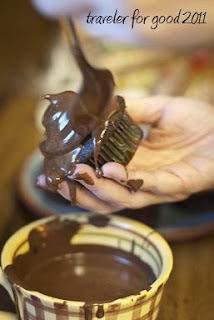 You can use the same pan of simmering water you used for the frosting to melt the chocolate and oil in a heatproof bowl. Once the chocolate is melted, pour it into a small deep bowl, in our case a mug, and let cool for 15 minutes. Then it's time to dive in. Take the chilled cupcake and quickly dip the frosted top in the melted chocolate, using a spoon to cover any of the white if necessary. Pop them them back in the fridge after the dip to allow for the chocolate to set. Prepare to awe your family and friends. You did an excellent job on these! My first and only try was such a disaster. I think that the whole dipping thing is very difficult to do. I will need to go back to the original recipe and compare it to your post and see if there are any difference. I would love to have mine look as stunning as yours. Well done. Thank you! I wasn't sure either since this was my first go-round with this type of cupcake. It gives me hope for future crazy recipes!